Chicago's bracing for what is may be the 2nd worst storm ever to hit the Great Lakes, due to come around rush hour tomorrow morning. Well, California took over dairy. We have to have something going for us. I am supposed to be at a press drive event tomorrow near O'Hare. I guess I will find out the vehicle handles in the wind. I can also see Russia, and part of Neptune. Last edited by Oliveloaf; 26 Oct 2010 at 06:21 PM. Power keeps blipping with each gust of wind outside. Gonna have to pack up. This can't be good for the ol' iMac. This is not a good night for any form of electronic based entertainment. Well, I'd hoped my 6,000th post might be interesting and I suppose this qualifies: a window got blown out of its frame here. Nothing hit it. It just straight up blew out and across the room. What the hell? 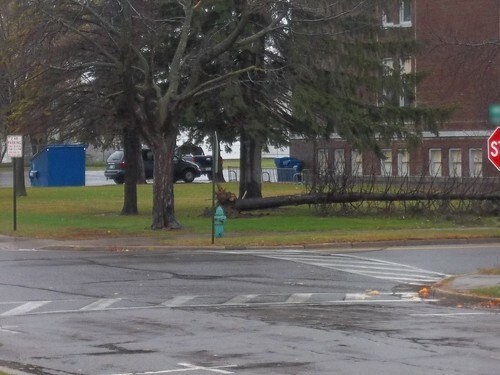 I'm really curious to know how strong that gust was. The power went out for the afternoon, so a friend and I watched the waves from a couple of places on Superior -- the wind was piling up the lake on our side. Waves were breaking over our harbour's breakwall. Gusts were about 50 mph, so it was fun to walk about on the boardwalk, but no risk of harm. On one flat, exposed parking lot, I put the SUV in gear and let the wind blow us along -- we made it up to about 10 mph. It has been a noisy couple of nights, for my chalet has a tin roof. Last edited by Muffin; 27 Oct 2010 at 09:16 AM. Man, where WAS this storm? It seriously missed us completely. The satellite TV never even went out. Muffin: That sounds awesome. I Lake Superior. Zuul: Dang. Glad you weren't hurt! Last edited by Sarahfeena; 27 Oct 2010 at 10:32 AM. My Internet is still pretty much nonexistent. Hopefully this'll go through before I'm lost again. As I discovered throughout the night, a lot of windows are missing storm windows, a lot of them don't stay sealed enough, and this house gets very, very drafty. So last night with nothing else to do I took a blow dryer and some plastic and started sealing things up. Sigh. The landlord is going to be told quite firmly she needs to fix the window situation. I'm really hoping the Internet gets a bit more reliable here soon. Hopefully I'll be on for more than five minutes later today.
. . . put the SUV in gear . . .
Should have written: ". . . put the SUV in neutral . . . "
Wow, you all really got hit Zuul. Sorry to hear about the windows, and really glad you weren't standing in front of it at the time! We've got a bright sunny 70 degrees here, with winds about 45 mph. Amazingly, the leaves are still on most of the trees, just hanging out swaying prettily. Tonya, next time? I will gladly send the weather your way. Today it seems even gustier here than yesterday...it's making sounds like thunder in our chimneys. I've never seen a bluer sky, though, and not a cloud to be seen. It's still all gray here and drizzly. The wind seems to have died down quite a bit, but the DSL and phone service is still spotty. In one of the brief moments when I was able to read the news online I saw some woman had been impaled by a tree branch that went through her windshield while she was driving. Yeesh. Was just at at meeting near O'Hare airport. It was crazy to see how much the landing planes were being jostled by the winds. I imagine it's especially crazy on board. Snow squals along the north shore of Superior yesterday. We had a little bit of snow on the southern side as well! I'm counting on the southern side (or more correctly, the middle of the lake) getting a lot of snow -- this season I'm buying a ski pass for Mt. Bohemia out at the end of the Keweenaw. Time: 06:45 PM (GMT -4).